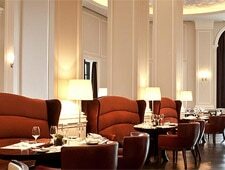 Chic signature restaurant of famed chef with steaks and much more. : With its ground-floor and corner setting, this upscale steakhouse looks as refined as any white tablecloth restaurant without any trace of the typical dark woods-and-brass décor of most steakhouse eateries. Even better, its menu is just as refined, with beef playing a somewhat secondary role. True, the entrées star several Prime beef dishes, but the kitchen is just as comfortable with Maine lobster, roasted tilefish and seared cod. Amidst such elegance---and somewhat pricy offerings---it seems shameful to order simply a hamburger, but rest assured, this restaurant’s version with its cheese topping deserves attention because the primo beef is tender and flavorful. After all, this is Jean-Georges Vongerichten’s own restaurant. Plan to order an appetizer---the crispy calamari are a bit oily, but we like the yuzu dipping sauce---as the choices include bacon-wrapped Gulf shrimp with avocado, and baby iceberg lettuce with crispy bacon and blue cheese dressing. Ask about desserts: you may decide on a dessert wine, but if you are tempted, look for a warm chocolate cake or a crème fraîche cheesecake. It’s all very posh and decadent.